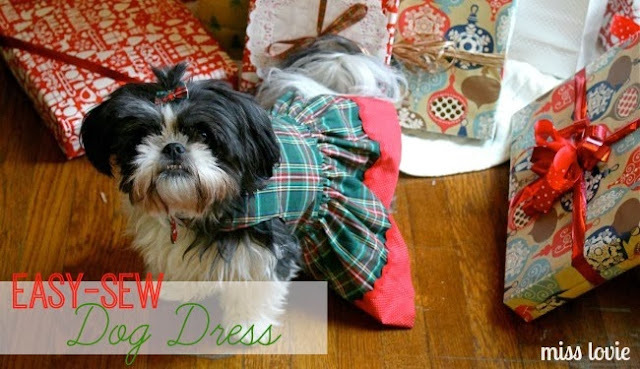 I am aware Christmas is over, but I just had to share this Easy-Sew Dog Dress with you guys! 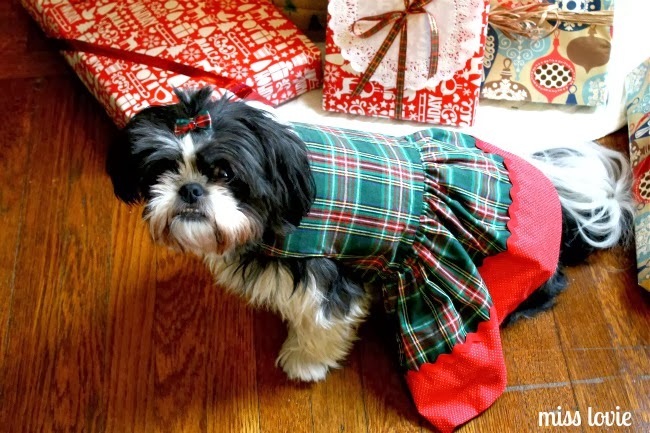 We took our honeymoon over Christmas, even though our wedding was at the end of October (teacher problems), so I was scrambling to get Christmas gifts finished and delivered before we left which gave me no time to post these pictures of our cutie dog in her fancy new dress. 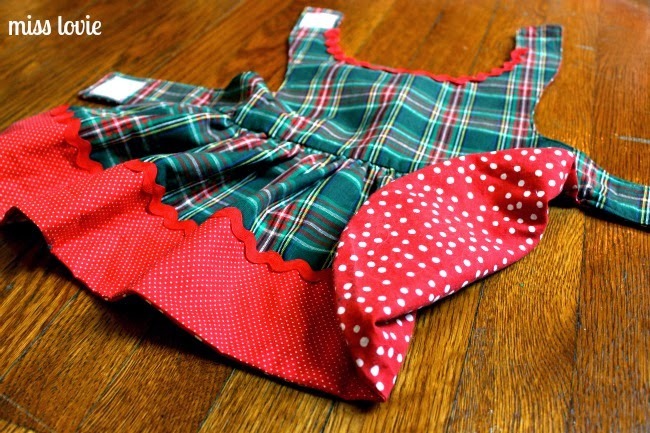 I used the Sweet Pea Dog Dress Pattern that I purchased from the Etsy shop, Sofi and Friends and it turned out so cute! Confession: until now I had never used a real sewing pattern before. Truth. 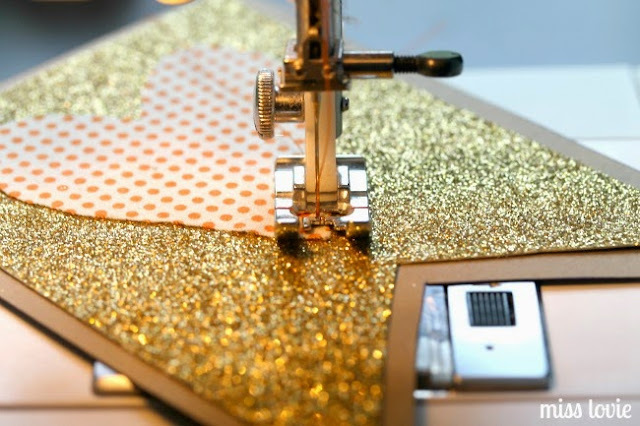 I've sewn quite a bit and have posted several projects here like my faux chenille baby blanket, Crinkle Tag Baby Toy, Easy DIY Hammock, Travel Felt Board and more, but they have all been sewn using online tutorials (aren't blogs the best?!) or just ideas I came up with. But after taking a Pattern Reading Class at our local Sewing Shop, Sew Dayton (a great place for designer and vintage fabrics and notions and sewing classes if you're in the Dayton, OH area! ), I felt ready to tackle a real pattern. 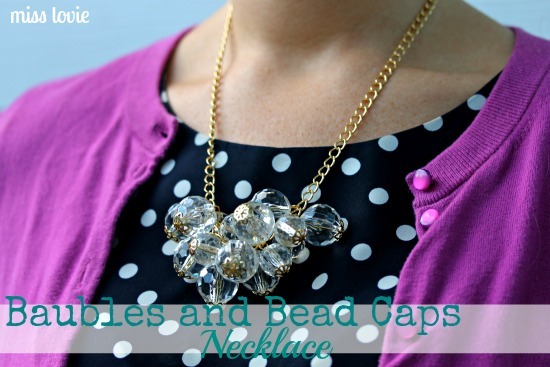 As Jesy at Sew Dayton, suggested, I started with an easy pattern. 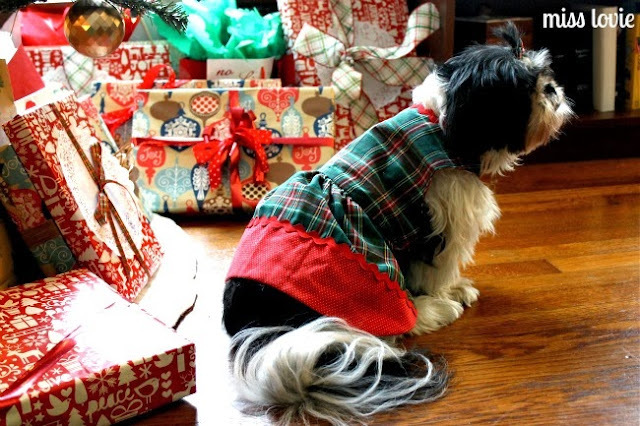 The Sweet Pea Dog Dress Pattern was perfect. It had easy to read instructions and pictures that helped guide you. I highly recommend any patterns from the Sofi and Friends shop! Plaid probably wasn't the easiest choice of fabric because of all the lines that should be straight/match up, but I couldn't help myself. Somehow we already had a bow to match. It was fate. I sewed this dress for our dog, Nix, in a few hours before leaving to go to a Tacky Sweater Christmas party with friends. I thought about adding some ridiculous trim or applique to the dress to make it a "tacky" dress, but I wanted her to be able to wear it throughout the Christmas season. While Nix is fancy, she is also practical. 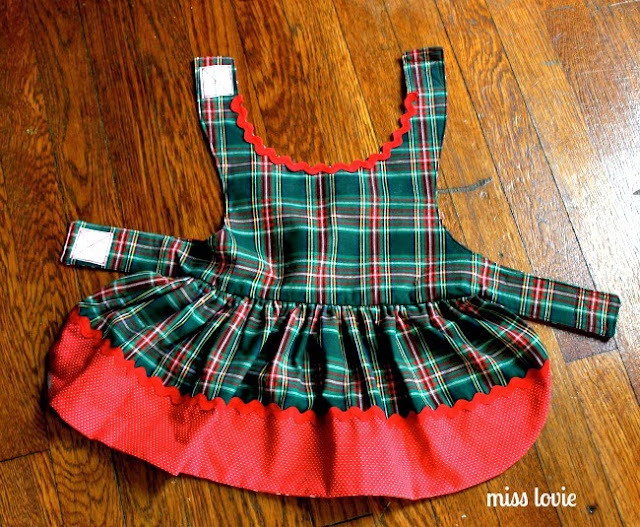 The pattern comes with instructions on how to add a band to the middle of the dress and a bow, which would have been a nice touch, but I ran out of time. The Sofi and Friends shop makes patterns for small dogs and Nix is a shih tzu so she's more medium sized so I purchased the XXL size. It felt weird because I don't feel like she's XXL, but I went by the measurements laid out in the listing. If you plan on purchasing the pattern, be sure to read that part carefully and measure your dog. It's even lined. So fancy. For my first sewing project from a pattern, I'm feeling pretty proud of myself and ready to tackle new things. I hope everyone had the best Christmas yet and are enjoying time with your friends and family! Thank you so much for reading and I look forward to sharing more with you soon. 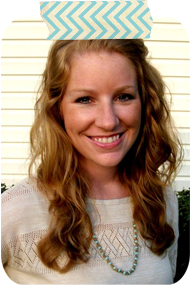 Hey Miss Lovie readers! 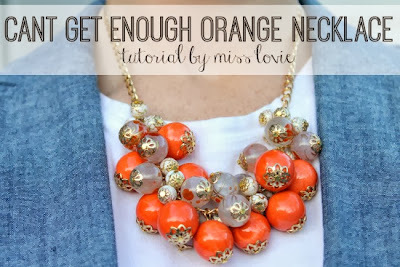 Today I'm back over at Thirty Handmade Days with another jewelry tutorial, my Can't Get Enough Orange Necklace! 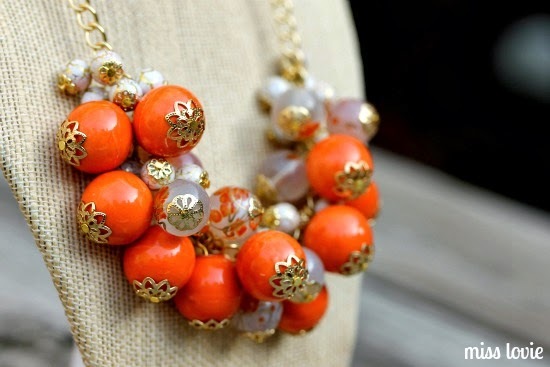 I am LOVING this one. 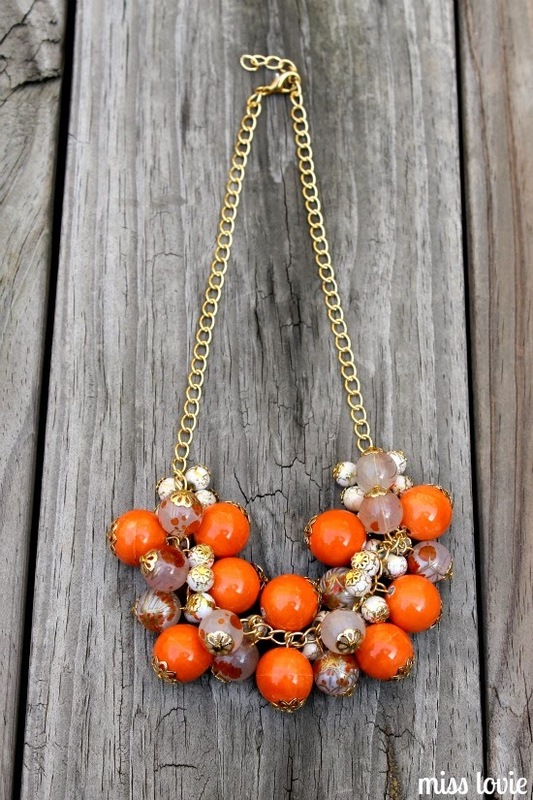 Maybe it's because I'm obsessed with orange right now. Click on over for the full tutorial! I know. Fall is over, I guess. But it's really not, people. I know the department stores, your neighbors' house strung with lights, Pinterest, and all the bloggers ever are insisting it's Christmas already, but it's actually not winter yet. We haven't even had Thanksgiving!! 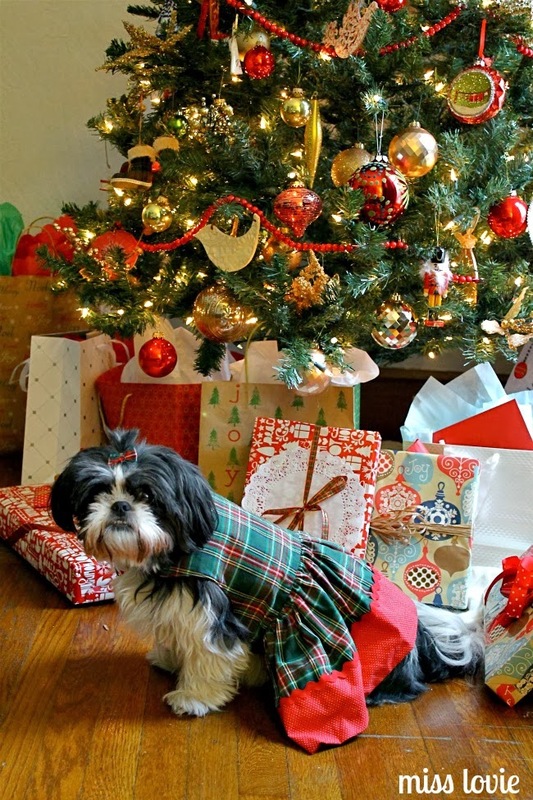 Believe me, I'm tempted, just like you, to stay up until 1 am decorating the Christmas tree almost every night of the week these days, but I refrain. Why? Because I love pumpkins. I can't bear to throw them away yet. They're not even rotting. Also because of Thanksgiving. 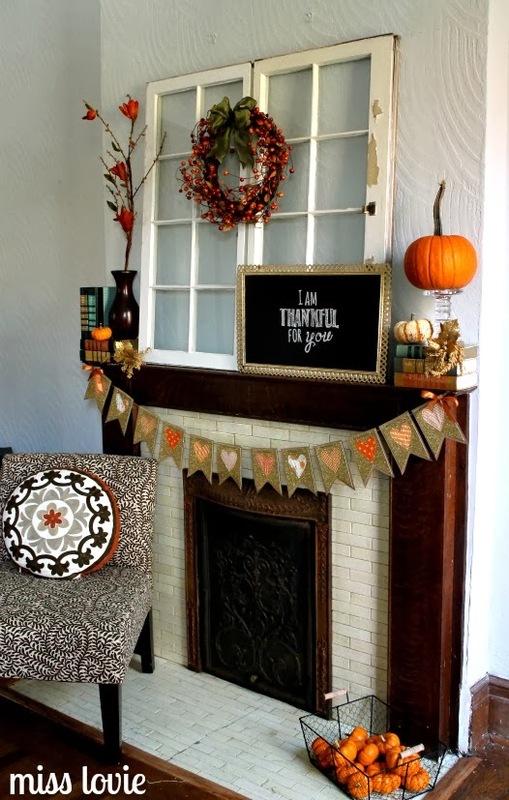 I thought for just a minute I might be hosting Thanksgiving this year for my family, and even though I'm not now, I decided to decorate my mantel for the holiday. More on that in this post! 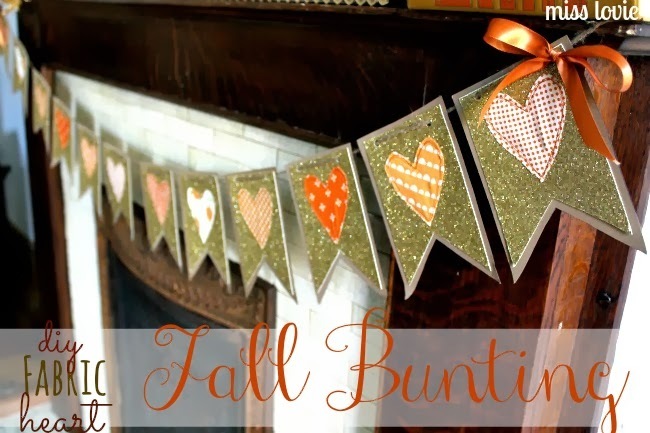 I knew I needed a cute flag bunting to hang. 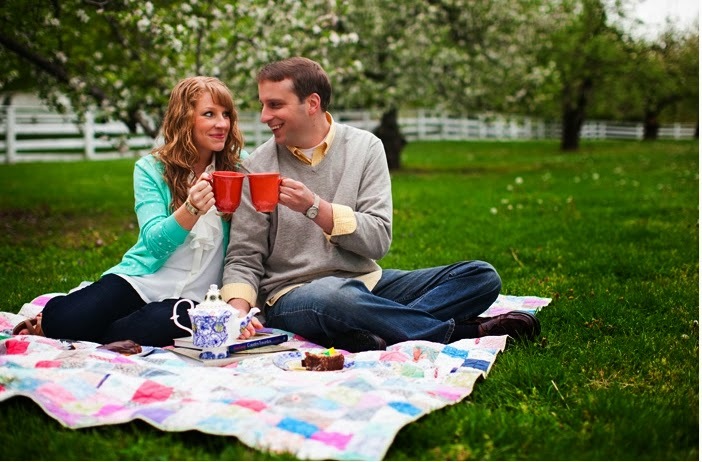 Luckily I had already made this sweet fabric heart one for our rehearsal dinner before our wedding a couple weeks ago! I love it when I can reuse decorations for different occasions. Here it is on our Thanksgiving Mantel. Sadly I don't have any quality pictures of it on the mantel at the Rehearsal Dinner. It was pretty cute there, too. Want to make a sweet fabric heart bunting for your house, too? 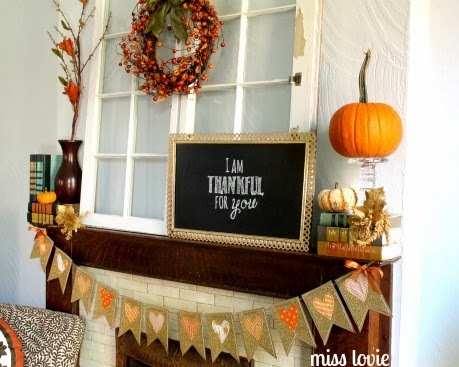 Of course you do, this could be used for ANY holiday or season- not just Fall or Thanksgiving. Think pink and red patterned fabrics for Valentine's Day, plaids and reds and greens for Christmas, or your child's favorite colors for their birthday! Bam. 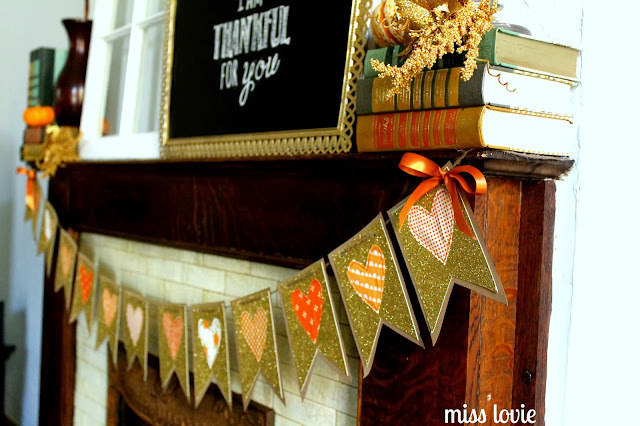 Most versatile bunting tutorial ever. 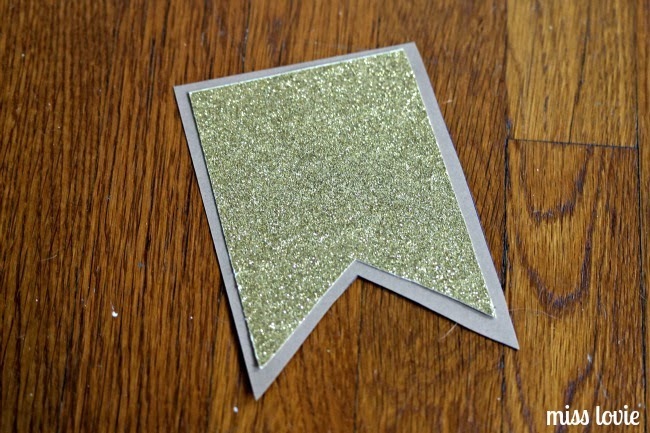 Print the templates onto card stock and cut out. Use templates to trace and cut the flags onto the paper and then glue. I made 12 flags and this made my bunting about 5 feet long. 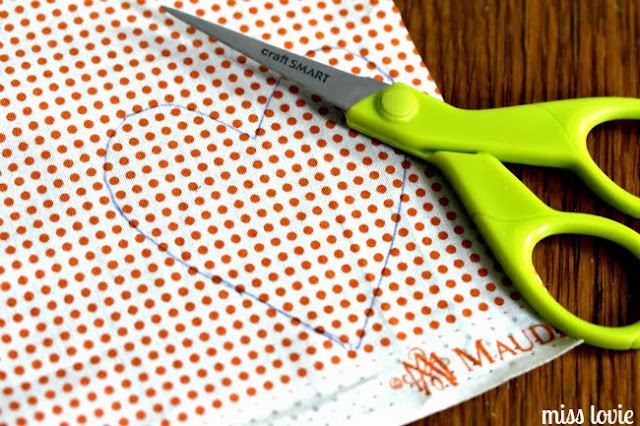 Trace and cut the hearts into the fabrics. Sew the hearts onto the flags. I didn't pin these or anything because it's difficult to do through the paper so the fabric will shift on you some. 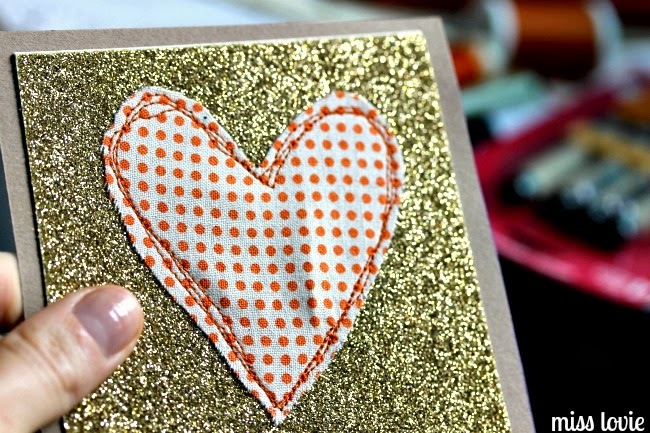 I found it easy to sew one side of the heart and then turn the paper while the needle was still down, sew back over the side I had just sewn and then sew the other side. After a little trial and error, I found that this decreased the amount of bubbles in the fabric. It may not be totally flat, but that's okay. I then sewed around the heart another time or two to create a kind of sketchy outline as you can see in the photo below. You finished a flag! Repeat however long your hear desires. Use a hole punch at the top of the flags as shown and thread the twine through, starting at the back, allowing the twine to sit on top of the flag and then threading it to the back again. 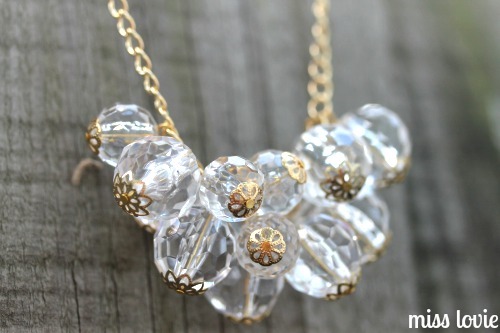 Hot glue some bows onto each side if you like and you're done! If you like, you could put a tiny dot of hot glue on the back of each flag and press the twine into it once you have it placed where you want so the flags don't slide around. I didn't do this in case I want to use the bunting somewhere else and space the flags out a little more. They don't really move too much once you've got them hung. 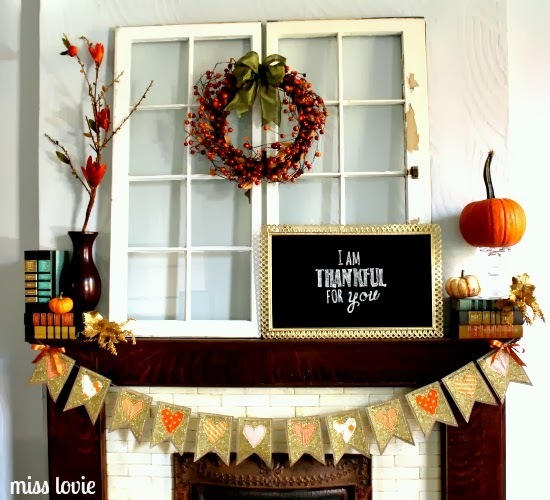 If you loved this tutorial, be sure to go check out my Thanksgiving Mantel as well! Thanks for reading. It's good to be back. I hope to post a little more regularly now that the wedding is over. 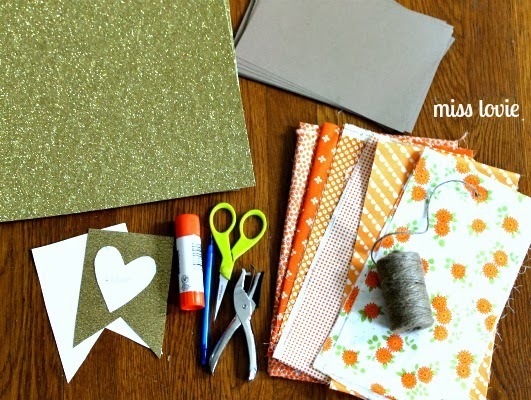 More diy wedding tutorials are definitely in this little blog's horizon as well. 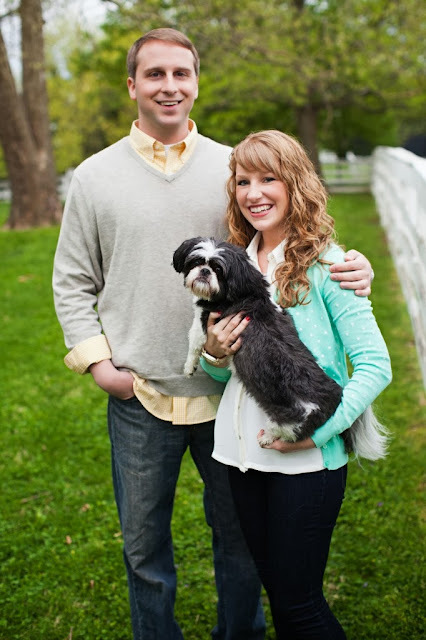 My wedding was a couple weeks ago so now I am back to blogging as usual, I hope! 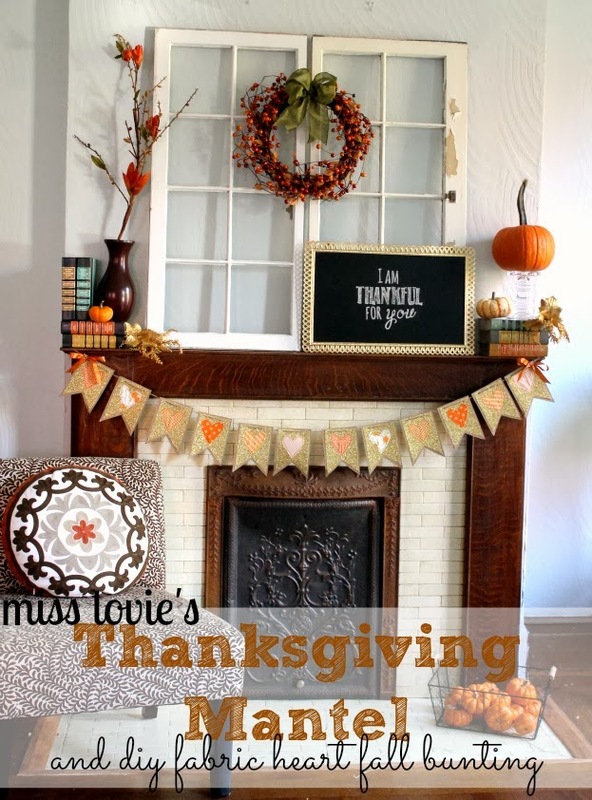 Today I have my Thanksgiving Mantel for you! 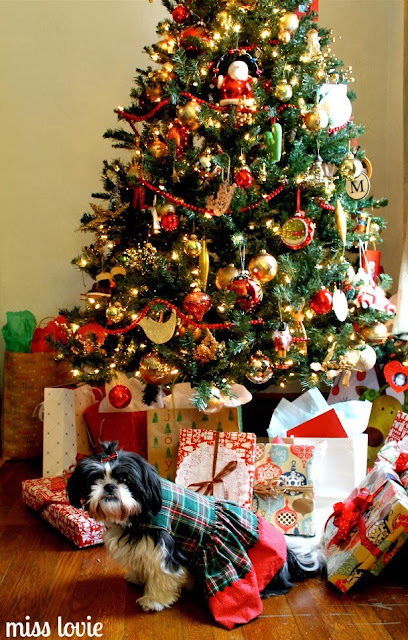 I know a lot of you are already decorating for Christmas, but bypassing Thanksgiving is just so sad! 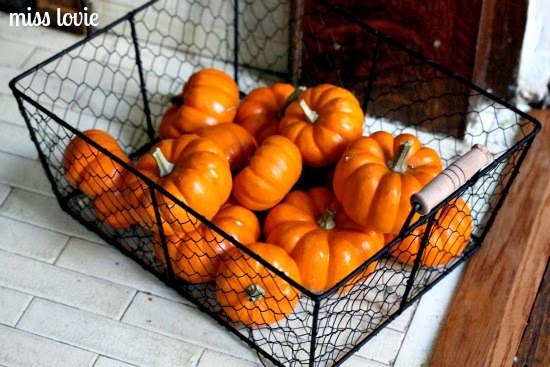 And so is throwing away pumpkins before they're done. 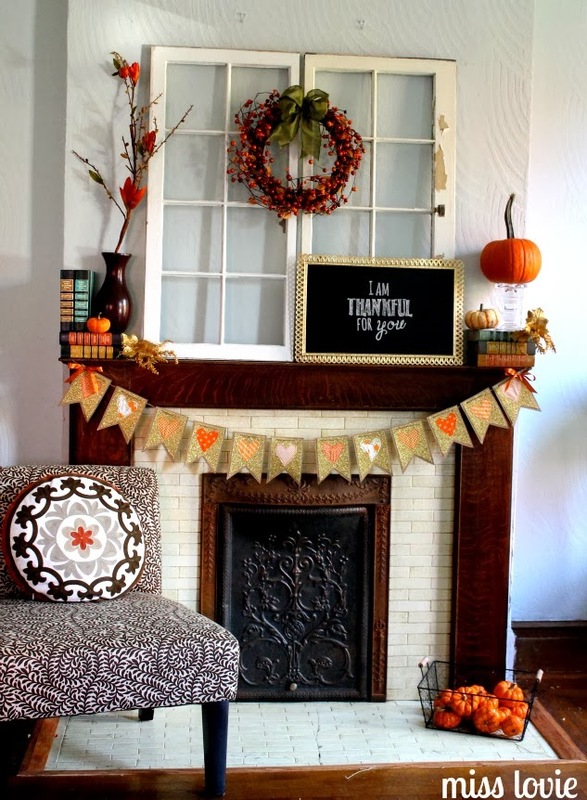 I love pumpkins and mine are still kicking so a Thanksgiving mantel it is. My tree can wait a few more weeks before it goes up! I hope you enjoy my mantel. We started renting this old home in a historical district back in May of this year. We've been so busy since that I'm just now getting the chance to decorate this beautiful fireplace for real. 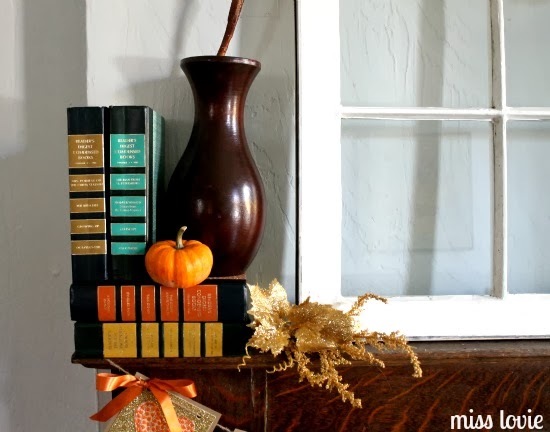 The mantel itself is very narrow so that brought a bit of difficulty finding pieces that would fit up there, but I found a few things just around the house that worked well. 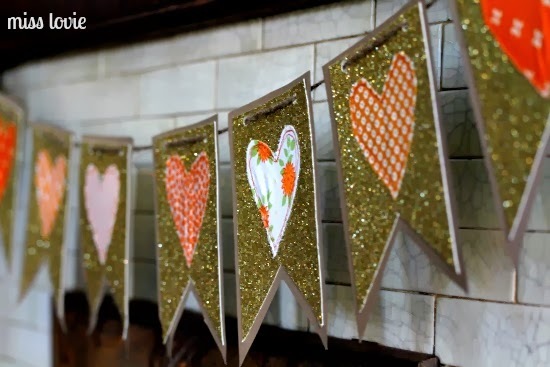 If you love the Fabric Heart Bunting, go here for the full tutorial and templates! Mr. Lovie and I bought the old windows off Craigslist and got a crazy awesome deal for them along with a few others. They were originally intended for wedding decor, but I'm so excited they double as decorations for our home! These awesome Reader's Digest books came from a yard sale. I love the colors in them so much. 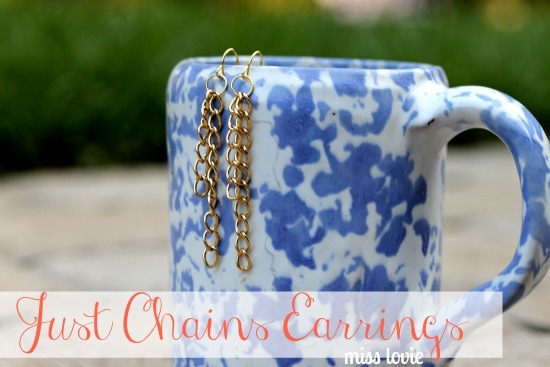 They tend to be the item that ends up in every room when I move items around to decorate because I love them so much. 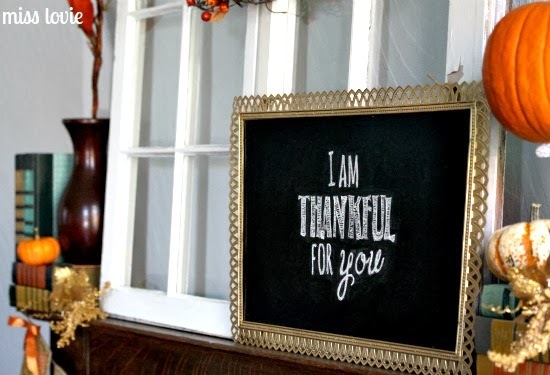 The chalkboard frame came from Home Goods and I think the frame was originally blue? I spray painted it gold and used it in wedding decorations as well. 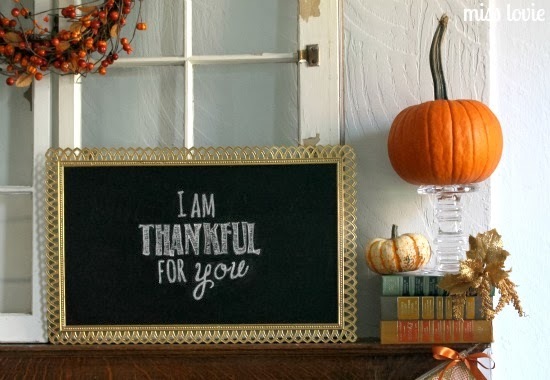 I used this chalkboard art tutorial. It is so easy. Those who know me well know I cannot do pretty lettering on anything! Everything in this mantel design was done with things I already had so that was really exciting. I love saving money. 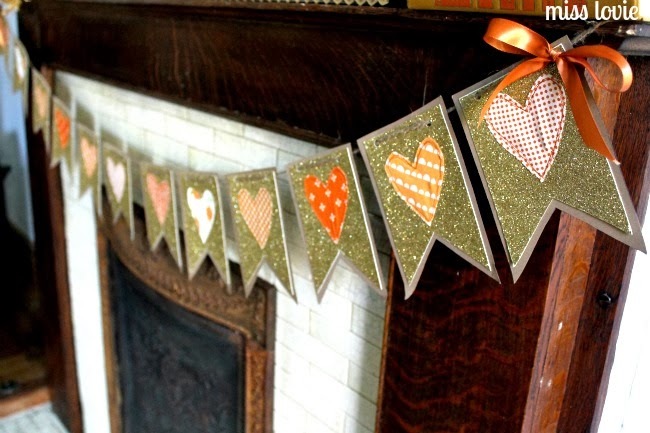 Love my fabric heart bunting? Find the tutorial and free template here! Pumpkins! These were left over from our wedding as well. I am definitely thankful for you!! 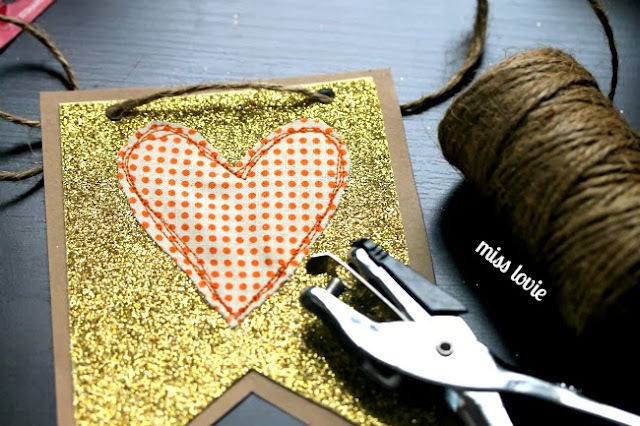 Again, you can find the tutorial and template for the heart banner here! I hope you have a very Happy Thanksgiving and a fantastic holiday season! 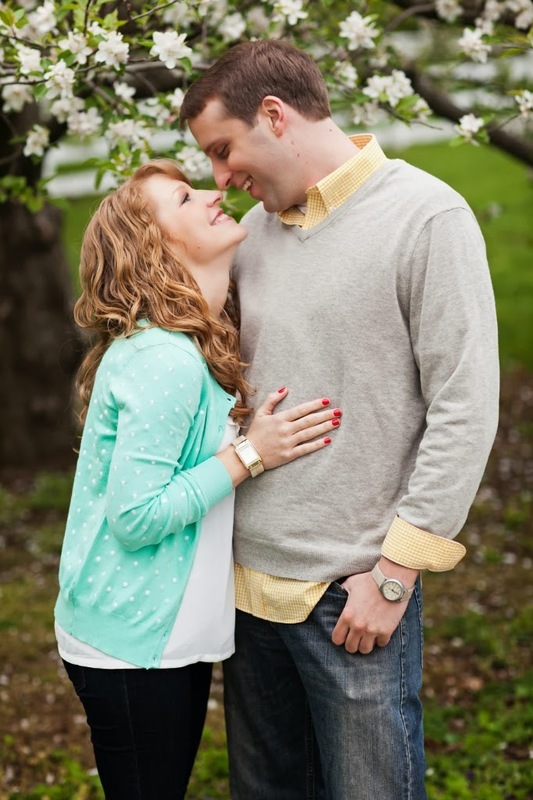 So in less than a week I get to marry this cutie. 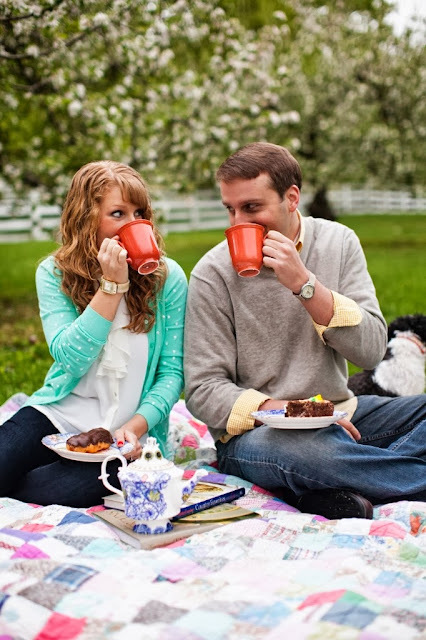 I thought in honor of that I would share a few of our engagement pictures taken by the wonderful Mary and Gabe of Honey Heart Photography (Lexington, KY). Aren't we just the cutest? Ha. I love us and I can't wait to be married. It's going to be so fun. While I knew planning a wedding would be tough, I had no idea I'd be as busy as I have been nonstop for as long as I have. Ha! Throw a pretty demanding job on top of that and you've got a girl with absolutely no time left to blog. But don't worry- I haven't stopped creating. 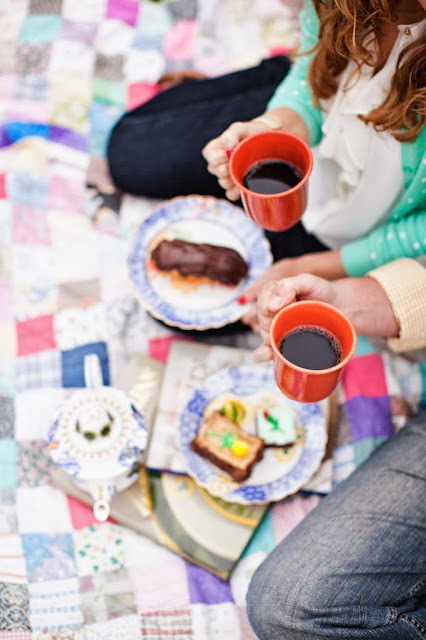 This wedding will have handmade (almost) everything! It has been seriously fun... and seriously time consuming. :) I wouldn't have changed it for anything, though. I can't tell you how many times I told Matt or a friend about my idea for something and they would look at me like I was crazy and would try to tell me to do something easier, and I, of course, wouldn't listen. Almost everything has turned out how I had imagined or better than I'd imagined, and that has been so fun. I hope to share it all with you after the wedding. Stay tuned friends. 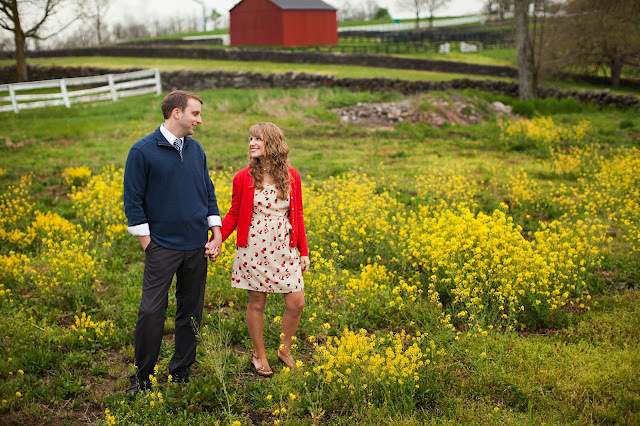 If you loved these pictures, you should so check out Mary and Gabe of Honey Heart. They're kinda great. 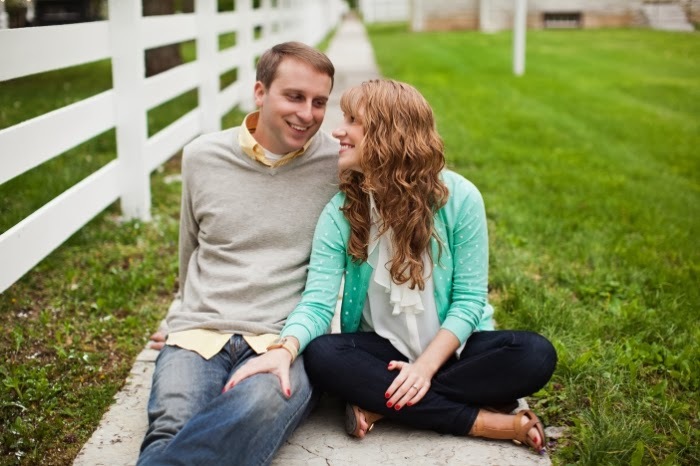 Excited to spend some more time with them on Saturday. Today I'm over at 30 Days Handmade sharing my Baubles and Bead Caps Necklace Tutorial! When writing the post for tomorrow's jewelry post I'm contributing to 30 Days' Blog, I realized I never shared last month's! Oops! 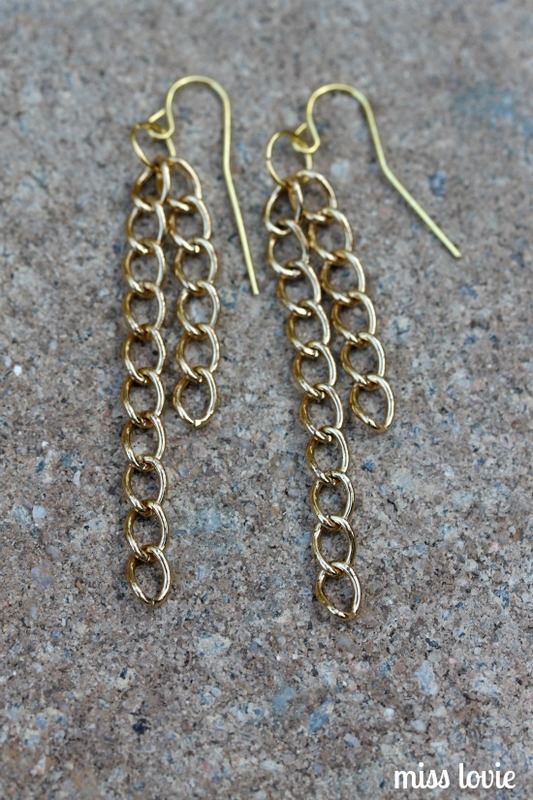 Go check out my Just Chains Earrings Tutorial!